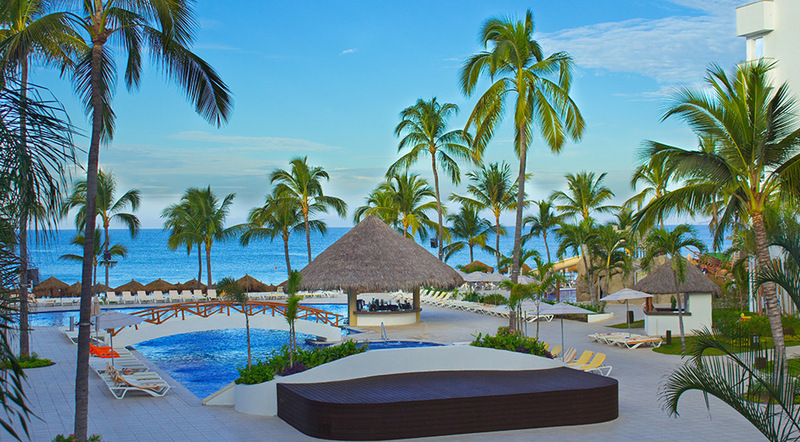 As the largest all-inclusive resort in Vallarta, this beachfront resort is sprawling with a fun and upbeat atmosphere. 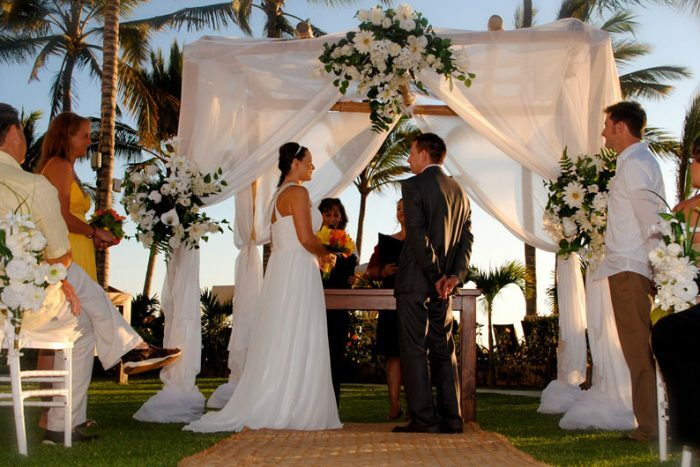 A Marival Nuevo Vallarta wedding is perfect for couples desiring an entertaining, family-friendly destination wedding. Located on the beautiful Banderas Bay, the beach stretches over 900 feet, and is considered to be one of the best in the Nuevo Vallarta area. Whether you imagine a gorgeous sunset or the tropical gardens as the backdrop to your wedding, your ceremony will be magical as you walk down the aisle at Marival Nuevo Vallarta. Renovations: In 2016, Marival Nuevo Vallarta renovated a majority of their guest rooms. They now feature modern decor with bright colorful accent walls, and artistic touches like large framed paintings and unique bedside lamps. Guests can expect contemporary finishes like sleek dark-wood furniture and burnt-orange accent colors to compliment them. The bathrooms were upgraded with stylish touches like glass shower doors and quartz counters. Guests will feel a sense of ultimate luxury in the newly-renovated guest rooms. The resort offers everything from studio style rooms, to 3 bedroom suites to accommodate and provider options for a wedding group of any size. 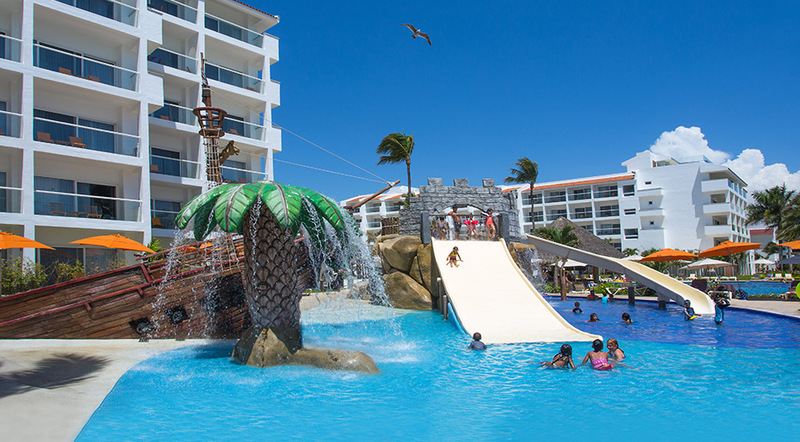 Complimentary kayaks, boogie boards, and bikes are available for all guests to enjoy, as well as a waterpark, splash pool with waterslides, mini-golf, and an open-air theater that are all on-site. The base price for this package is $2499, but complimentary when booking a minimum of 15 rooms for 4 nights. Upgraded packages, additional guests, and add-ons are available for an additional cost. 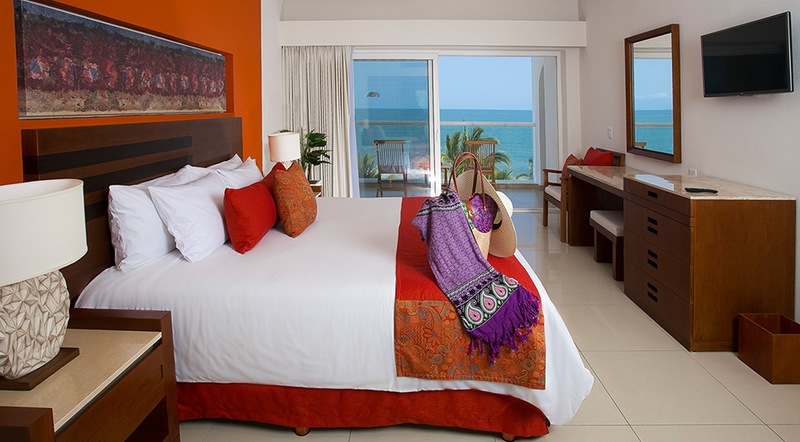 Rooms range from $115 – $170 per person per night. Every room includes a private balcony or terrace. Wifi and room service will include additional fees. Children 3 and younger stay free. There are 497 total guest rooms with views of the garden, pool, or ocean. The guest rooms are spread between 11 villas, 1 main building, and 2 towers that are 5 stories high. Connecting rooms are available upon request. Handicap rooms are limited to the ground floor, but all buildings include elevators. Patio – 80 guests max, Garden – 60 guests max, Beach – 50 guests max. All standard guest rooms allow up to 2 adults and 2 children max, or 3 adults. The family emotion and two bedroom suite room categories hold up to 7 guests, with 4 adults and 3 children max, or 6 adults max. The three bedroom suites room categories hold up to 9 guests, with 4 adults and 5 children max, or 8 adults. Children are ages 12 and younger. The resort will host no more than 2 weddings per day, Monday thru Sunday. Ceremonies can be held at 3pm, 4pm, or 5pm. All ceremonies will be held separately. High-season months typically include January, February, March, April, November, and December. It is always encouraged to have your guests book their stay 8 – 12 months in advance, as the resort has an 80% chance of selling out during these months. Marival Nuevo Vallarta is located about 9 miles from the PVR airport. The resort is about 30 minutes outside of downtown Puerto Vallarta. Q: What makes Marival Nuevo Vallarta such a great place for a destination wedding? A: The hotel itself is lovely and located on a beautiful beach, 30 minutes from Puerto Vallarta, with brilliant sunsets that make for an especially romantic and dramatic beach wedding. Ceremonies take place on the beach or Garden. Q: How many weddings have you coordinated, and what is your favorite part? A: Wow!! A difficult question, I already have 8 years of experience with weddings. The best thing is that each wedding is different, even if i offer them the same location, same schedule, same menu; destination weddings will always be a new experience. Q: Is there anything else specific to know about any of the venues? A: It is important to mention that we have a new Beach Club Residences opening soon, which will be a new wedding venue, and a great place for weddings!